‘Does the Geelong community want to be a Waterfront City with a port at its front door, inhibiting city growth and liveability? As the city of Geelong grows in population, Geelong and the region understandably feel the pressure of accommodating more people, jobs and food production. However, when we look at the densities required in global cities to drive better public transport, innovative business start-ups and growth, a larger central population is just what Geelong needs. The council region of Geelong is predicted to grow 38 percent by 2030, from current numbers of approximately 215,000 to estimates of 290,000. 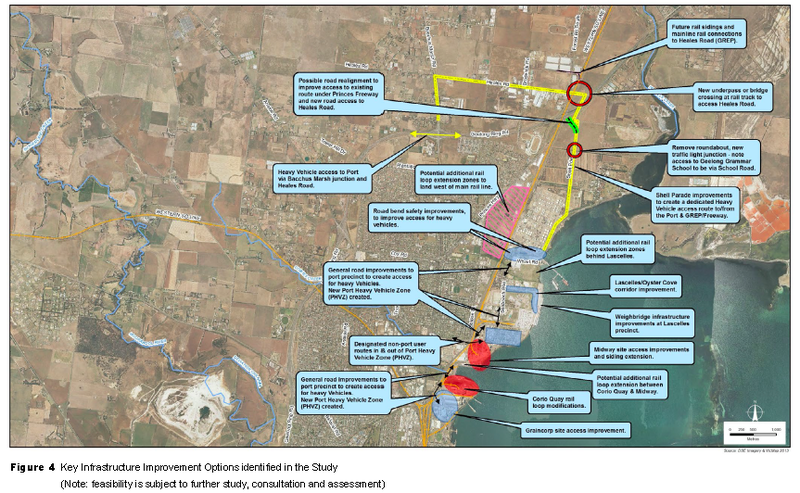 Local community is concerned about the impact that this and expanding urban growth boundaries will have on the city of Geelong and neighbouring coastal townships. Current urban expansion into prime agricultural land surrounding Geelong reduces the available area for food production in our region. This is in conflict with state and federal government priorities to increase regional food production for domestic use and export growth. Increasing population growth within the city of Geelong is advantageous as it concentrates housing density and economic benefits in areas with existing physical infrastructure and amenities such as public transport, educational and health facilities. This is in conflict with current plans for heavy industry and port upgrades within our city boundary. The issue is not whether Geelong has a port, as it is an important economic industry supporting agricultural and industry exports, but where our regional port should be located. Currently our port is located on inside the city on the Corio Bay Inner Harbour, in an area originally outside the Geelong township. At an average depth of four metres, the need to dredge the Inner Harbour to support this port location has been constant since European occupation. Relocating the port from the Geelong waterfront to the deeper Corio Bay Outer Harbour decreases the need to dredge, releasing city waterfront land for regeneration, creating northern waterfront suburbs. There is a regional push to maintain our port for regional exports and economic benefit. 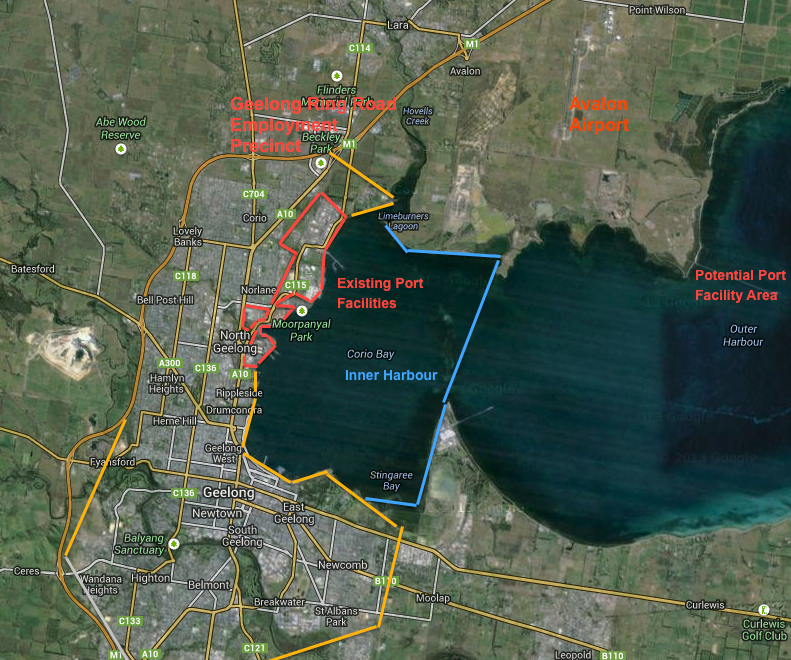 With a state commitment to build the direct rail linkup to the international Avalon Airport costed at $100 million (2013 Priority Projects: G21 Regional Plan Implementation, November 2013) the surrounding Corio Bay Outer Harbour area becomes a feasible site for port relocation providing an international transport hub in close proximity to the Geelong Ring Road Employment Precinct. With over $768 million dollars proposed for associated existing port facility upgrades (Geelong Port City 2050, July 2013) this funding allocation could be better spent on staging the port relocation and future proofing our city and port for the next 100 years. The timing is opportune with the Geelong Ford Factory staged for closure by 2016 and Shell Refinery looking to sell off its assets. The northern suburbs waterfront is estimated at 6+ kilometres of waterfront and 500+ hectares of land, more than twice the size of current urban regeneration projects at Melbourne Docklands and Barangaroo Sydney. The release of this highly valuable real estate will allow for mixed-use development, housing, large-scale investment and jobs. The urban regeneration would require remediation of the land and local waterways and sustainability criteria around building and precinct development. The recent joint ‘Vision 2 strategy’ produced for the Geelong city centre by the City of Greater Geelong, state government, Deakin University and local business groups was deemed a great success. This model could be applied to the city of Geelong as a natural progression, to create our liveable city future strategy. The benefits of regenerating industrial areas already serviced by city infrastructure and public transport, through the relocation of ports out of city centres, are demonstrated globally, from Nantes France to Copenhagen Denmark. Regenerating the northern suburbs is the opportunity to finally reconnect the city of Geelong creating a true city by the Bay, enjoyed by all. Barangaroo is currently 22 hectares of disused container wharves, with 2.2km of waterfront land. When complete, Barangaroo will include six hectares of new headland park, waterfront walks, commercial office towers, apartments, serviced by new and extended transport systems.